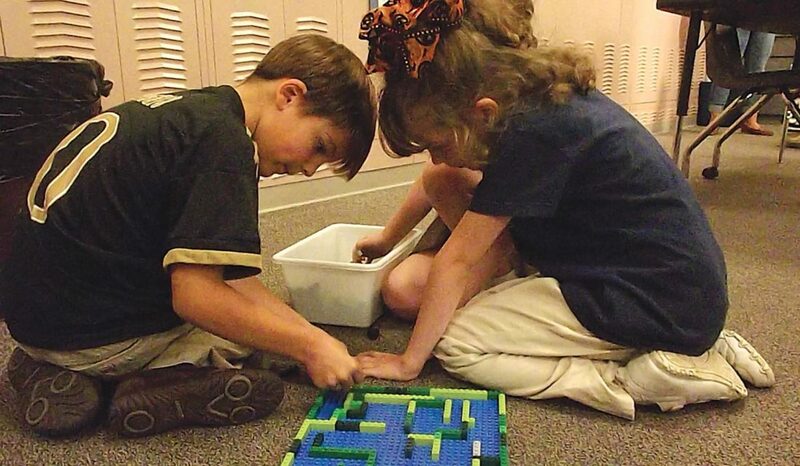 Mirror photo by Russ O’Reilly / First-graders George DelBaggio and Elle Young work together on a maze. Students in the McAuliffe Heights Program at Irving Elementary School are learning STEAM, or science, technology, engineering, arts and math education. Mirror photo by Russ O’Reilly / Shayan Gohar (left) reads instructions to build a hydrocar as Landen Dunkel (center) and Isaiah Vaughn listen and collaborate. The students said they must inject water into the fuel membrane to be converted into electricity to power the car. Legos, robots, cars, paint and children are scattered everywhere in each classroom for an hour. It might look like recess at first glance, but a closer look shows something else going on during “What I need time” at the McAuliffe Heights Program at Irving Elementary School. It’s the school’s first crack at STEAM, or science, technology, engineering, arts and math education in earnest. Over the summer and through the fall, the school has invested in professional development through the Intermediate Unit 8 because teaching STEAM is new. As a Penn State professor told faculty during a session, ‘How do you even teach STEM? '” STEM doesn’t include an arts component like STEAM. For now, it’s mostly facilitating, especially in the older grades. 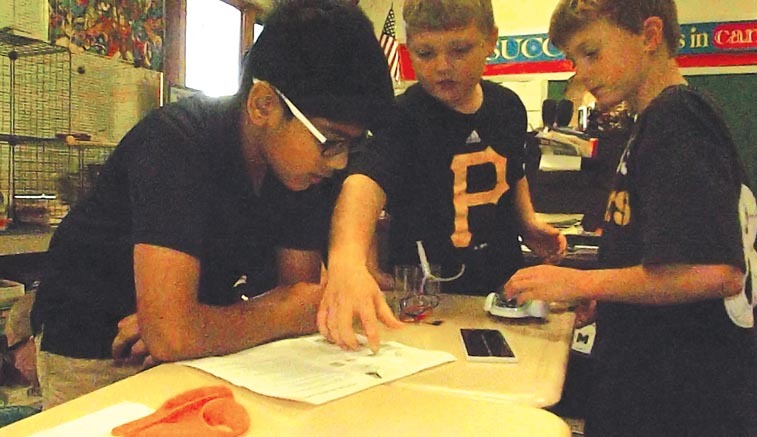 Fifth-grader Shayan Gohar read instructions aloud to his pals Landen Dunkel and Isaiah Vaughn, who each had pieces of a “hydrocar” in their hands. They huddled over a makeshift table of four desks. Mirror photo by Russ O'Reilly / Shayan Gohar (left) reads instructions to build a hydrocar as Landen Dunkel (center) and Isaiah Vaughn listen and collaborate. The students said they must inject water into the fuel membrane to be converted into electricity to power the car. It squirted the students in the face by accident, but they went back to building what they said was a “car that converts water and air into electricity.” It can also be solar powered, Isaiah said, but they did the water-powered configuration. 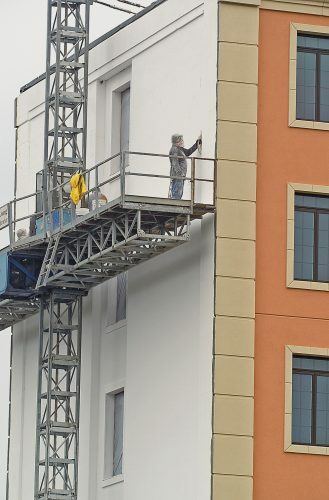 Once built, they took it out into the hallway. It didn’t go fast and took awhile to charge. But they weren’t irritated, they were experimenting. Altoona Area Assistant Superintendent Patricia Burlingame said she especially likes the idea of McAuliffe Heights students and teachers sharing their STEAM privileges with other schools for joint sessions. One such session was already held at Penn-Lincoln Elementary. Part of the response Burling­ame received was that the school practices “looping,” which keeps students with the same teacher for two years. The goal of looping is to help struggling students and allow teachers to really know their students. The faculty took up Burlingame’s challenge under the leadership of its second-year Principal Brandy Agnew. With extra preparation from teachers, as well as new supplies from IU8 and a private donation, the STEAM program was launched at the beginning of the year. Groups of students engaged on a recent Wednesday in STEAM activities on the floor or at traditional desks clustered together to form tables. In a kindergarten room, a teacher guided four students in using an iPad to program “Dash the cleverbot” to go, stop and light up with colors including red and green — a combination of reading and robotics. The school has five Dash robots that students program to perform tasks while learning things like angles along the way. “It blows your mind. They don’t even realize they are building collaboration, critical thinking and problem-solving skills. It happens on a daily basis here,” fifth-grade teacher Lars Steward said. Teacher Jason Little floated among groups of students painting, building bridges and hydrocars and constructing a marble drop system. The students were hands on and engaged. Little was in the background and could freely talk with the Mirror. 3-D printer in Little’s room. The Altoona School District Foundation has helped purchase STEM supplies for teachers at all of the district’s schools. In the future, the STEAM education practiced at McAuliffe Heights is meant to be implemented at the district’s other elementary schools. “As STEM becomes more developed, some things will become part of the budget and others we will look for outside money, donations and grants,” foundation director Paula Foreman said.